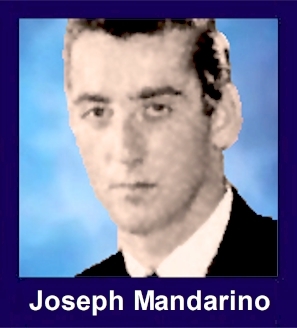 The 35th Infantry Regiment Association salutes our fallen brother, PFC Joseph Mandarino, who died in the service of his country on February 7th, 1968 in Quang Nam Province, Vietnam. The cause of death was listed as Small Arms/AW. At the time of his death Joseph was 21 years of age. He was from North Bellmore, New York. Joseph is honored on the Vietnam Veterans Memorial at Panel 38E, Line 6. The decorations earned by PFC Joseph Mandarino include: the Combat Infantryman Badge, the Purple Heart, the National Defense Service Medal, the Vietnam Service Medal, the Vietnam Campaign Medal and the Vietnam Cross of Gallantry with Palm Unit Citation. It's been a long time since that fateful day. We fought well that day and you did good. Why, why my friend, did you have to throw that damn grenade. You lay next to me now and we are pinned down. I do the best I can to comfort you. I want so much for all this not to happen but the fight is so bad. We called for medivac for you my friend but they shot it down. Now as you slip away I wish you well. I tell you to have a good journey and the war is over for you. I hear you whisper, "tell my family I love them" then you slip away. You Joe will always be remembered by me as long as I live. You Joe were a good person and a good soldier. We started school together at Waltoffer Ave School & Newbridge Road. We lost touch until JHS. Joey treated me like a long lost relative when we reconnected in JHS. He was a wonderful person and for some reason his is the name that still chokes me up when I talk about him. I looked for his name on The Wall and all I could picture is a small schoolboy. I wish I knew him better or longer -- I guess we all do. RIP, Joe.